Going on holiday with surfers can be tricky, especially if you only understand part of why they have such a strong connection to the ocean. Loving them is great, but on a surf trip all that matters are waves. I’ve spent a lot of time watching, which I truly enjoy, but I am not a surfer. I haven’t spent my days in the water or dreaming of the next swell, as my companions I travelled with do, which had me feeling left out. The opportunity to join a trip solely meant for waves came up which made me hesitant. I decided to go, upon first arrival at Mahi-Mahi Surf resort my mindset of a surfing holiday changed. Here’s why. What it’s like to spend a day at Mahi-Mahi surf resort. 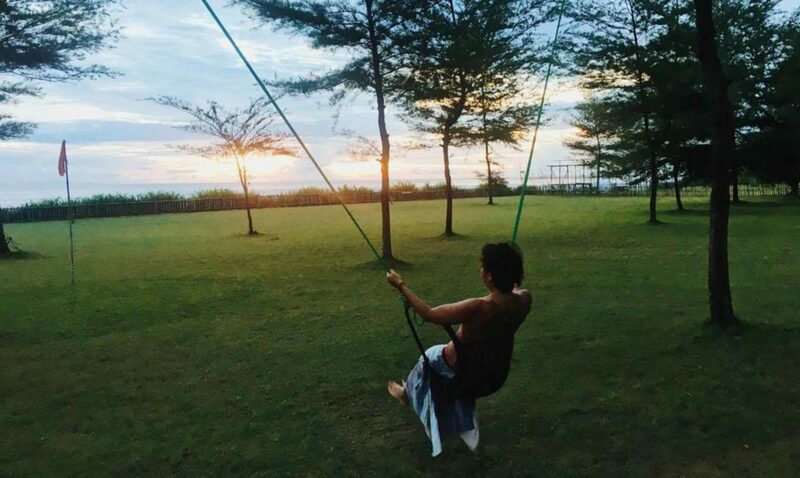 Our perfect morning ritual was awaking to a spectacular view of the ocean, followed by an early morning yoga class, then leading into a wonderful breakfast. MahiMahi offered and in-house yoga teacher who took us into a gentle flow, leaving my body relaxed and mind clear. Yoga by the sea reminded me the more you put in the more you receive, as with everything in life. After my session finished, I would walk on the vast stretch of beautiful sandy beach. Some mornings I would be greeted by local buffalo who used the stretch of land as their home. The animals were soothing and good company during the days the boys would be surfing. Lunch was time for conversation and connection with guests and crew, vibes full of love and passion were all around, the kind you can feel deep into your core. Smells of home cooked food filled the air, and happiness around me was vibrant. I spent much time in the communal space reading, chilling and allowing myself the luxury of doing nothing. Every now and then I would take a look at the surfers enjoying the swell while listening to magnificent sounds of the sea crushing the ocean floor. If reading is what you enjoy most, then the library at Mahi-Mahi will suite you. I found a copy of Bhagavad Gita and dove deep into the words as they flew from the pages to my mind. By the the afternoon I was ready for another yoga session, which Mahi-Mahi offers at four o’clock. 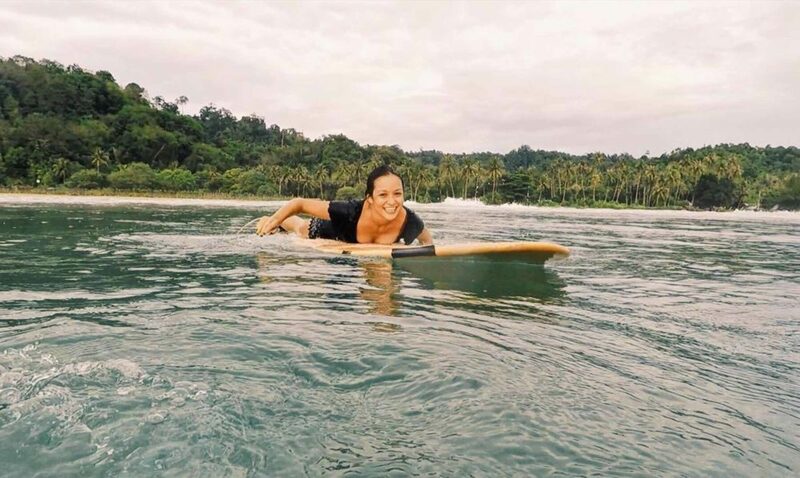 Paddle boards were available for rent, in the evenings my body and mind were clear as I would paddle out in the fiery red and pink sunsets that Simeulue would conjure each and every night. Mahi-Mahi crew has an “all you need” spirit full of knowledge of the Island. There is a plethora of sighs to see and outdoors to explore. River walks, distant hidden waterfalls to bathe in, hikes deep into the lush green jungle that surrounds Mahi-Mahi, and these are just some of the options available to you. Motorbikes and mountain bikes are available and no cost to resort guests. I went off on my own to explore my surroundings, all while making friends with the other guests. Snorkelling trips are readily available for those wishing to dive into the vast sea life of Simeulue. One bright and clear day, a crew of guests and myself took a trip to a uncharted paradise island, after 20 minutes of travel we ended up on a pristine beach unlike anything I’ve seen. Crystal clear waters of blue and green tones glistened in the sun as it kissed the shores of white untouched beach. Our guide for the trip was an expat from South Africa named Shaun, he was full of information and had a comforting spirit. He took us to a hollow rock that you would swim a few meters into as it would open up to an underwater cave. To me the idea was terrifying, but Shaun helped me through, as he inspired trust. I made it through and was rewarded with the natural beauty of wilderness and a new sense of adventure. A few interesting conversations arose during my time at Mahi-Mahi. The team there is highly tuned in and has several initiatives that support a positive economic and environmental impact as they promote sustainability in the nearby regions. A few of the many projects that Mahi-Mahi is involved in is a green business collaboration, community support for education, land a waste management and volunteering programs that inspire support for the protection of sea turtles that use the island as their nesting grounds. Lastly, I took the chance to take my first surf lesson. After the lesson I understood a bit more what surfing is about. Meeting the wave, rising, riding, falling and then my favorite part… paddling back for more! Shaun took me out to smaller waves. He had very supportive enthusiasm that helped me get into the spirit. The experience was fun, challenging and humbling. It taught me to surrender to the ocean, I ended up enjoying getting smashed by the waves, all part main starting point to learn how to surf. I now find myself looking at the sea to assess the waves and to see if they are the size for me to go and play – and that will surely make my next surfing trip more exciting. Mahi Mahi Surf resort is a good pick: good vibes, good people, good food and lots of opportunities to enjoy the tropical paradise that is Simeulue island in Indonesia.